The race to a 3-1 start is on, as the Saints and Hawks wage war for the Blue Ribbon Cup. An opportunity to go 3-1 beckons for both St Kilda and Hawthorn on Sunday afternoon. Both sides came tantalisingly close to achieving the perfect start to the season, but narrow losses to Fremantle and the Western Bulldogs respectively stood in the way. 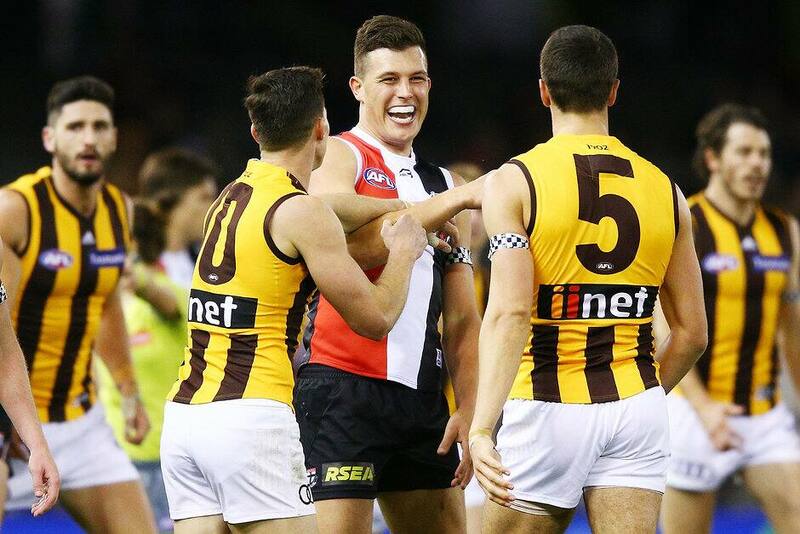 The Saints ruffled the Hawks’ feathers in last season’s Round 22 clash, but narrowly went down by four points after kicking just one unanswered goal in the final term. Sunday marks the 20th contest between the Saints and Hawks for the Blue Ribbon Cup. The fixture has been played between the two sides every year since 2000 in reverence of Victoria’s policemen and women and those who have given their lives in the line of duty. While any conversation to do with Hawthorn last year was heavily slanted towards Brownlow medallist Tom Mitchell, 2019 has been a different story. With Mitchell out with a broken leg and experienced mids Shaun Burgoyne and Liam Shiels hamstrung, the task falls to the Hawks’ other established centremen. Jaeger O’Meara has been the focal point of the brown and gold for Season 2019 with his game-changing flair (last week accumulating 32 disposals and 12 tackles), while James Worpel has exploded onto the scene with three consecutive games of over 25 touches. The class and consistency of Isaac Smith, alongside the fiery James Sicily (33 rebound 50s), have served as the Hawks’ springboard forward. A lot of their prolific play has stemmed from former Saint Ben McEvoy however, who is averaging a career-high 16 disposals, four contested marks and a goal per game to go alongside his 76 hit-outs for the season. McEvoy’s form serves as the perfect challenge for Rowan Marshall, who after two incredible games to begin 2019, is set for another monumental challenge after going head-to-head with Tom Bellchambers and Rory Lobb. Despite being down 175 games compared to his opposition counterpart, ‘The Prospect’ has enjoyed stellar form with his average clearances (six), tackles (six) and hit-outs (30) per game for 2019 above that of McEvoy on paper. He doesn’t shape as the Saints’ only danger man, with St Kilda’s Jack Attack raring to go. Jacks Steele, Billings and Lonie have all been superb in the opening three rounds and will give the Hawks sufficient trouble in their respective areas of the ground, while the possible inclusion of Jack Steven could give the Saints a damaging edge. Tune in to the boys' brand new podcast, Talking Jack with Jarryn, to find out! It will be a battle of toughness through the centre as Steele is likely to combat the force of O’Meara; their superior tackling abilities on full display. While Steele leads the league for tackles this season (25), the Hawks have the ascendancy in total tackles with 211 – just two ahead of the second-placed Saints. Billings’ form from the past few weeks has been mirrored by Hawthorn’s Jack Gunston, whose five goals to begin 2019 has him well on the way to another decorated season. The All Australian half-forward was held goalless last week, but he was in potent form against the Saints last season with four majors. St Kilda had their own response in Lonie that night, whose career-best four-goal bag – three of which were kicked in the space of five minutes – locked the small forward in as one of the club’s most important pressure players. Hawthorn’s dynamic recruit Chad Wingard enjoyed an impressive outing in his new colours last week and will be keen to make another statement. Off the field, the Saints boast a valuable weapon in the coaches’ box in Brett Ratten, and his insight could prove pivotal in breaking down the Hawks’ game plan. A chance to go 3-1 awaits for both sides, and neither will be content with an ‘honourable loss’. Round 4 is set to conclude with a bang.